The Sony CLM-V55 5" HDMI On-Camera Monitor with Peaking is a lightweight monitor that supports input signals up to 1080p. It features a screen with 800 x 480 resolution with a 90° viewing angle. The monitor accepts power from either an optional NP-FM500H, NP=QM71D, NP-QM91D, or optional AC-PW10AM power supply. It features peaking, that helps you to determine critical focus, and the pixel-to-pixel function enables you to zoom in on the center of your image. The included removable sunhood can be used for protection from glare, and collapsed to protect the LCD screen during transport and storage. To save battery paower, the monitor will automatically shut down if no signal is input for 60 seconds. The built-in speaker allows you to share the audio with those around the monitor, while the integrated headphone jack allows you to monitor audio privately. The 1/4"-20 threaded hole allows you to use stadard accessory for mounting the monitor, or you can use the included shoe adapter to secure the monitor to your camera. Note: The monitor does not have DSLR scaling to re-scale the video from certain cameras during playback. Black stripes may appear above and below or on each side of the monitor when the camera's aspect ratio is different from that of the monitor. Peaking is a real-time, focus assist tool that superimposes pulsing red lines over the area if your image that is most contrasy, and therefore most in focus. This makes it easier to confirm that subjects are in-focus or not in-focus. 1:1 pixel-to-pixel mapping allows you to look at the center of your image without any scaling, so you can see the actual detail and not be fooled by scaling artifacts. The monitor features a native 15:9 aspect ratio. When displaying footage normally, this may cause black bars to appear around your image. 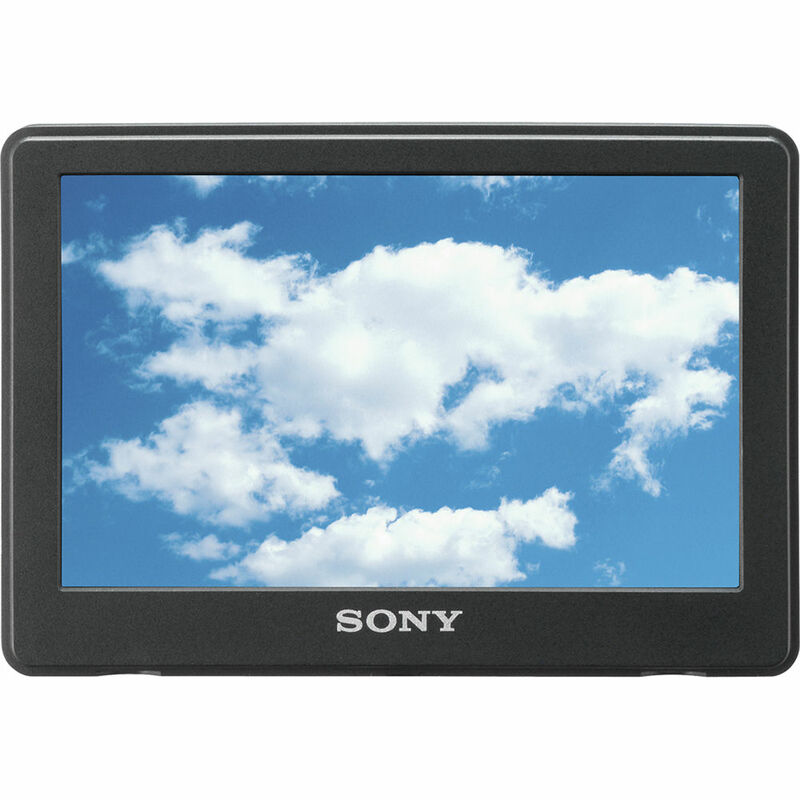 This allows the monitor to display your footage in its natural aspect ratio. Displays a grid just inside the angle of view that acts as a guide to the area shown on a LCD screen. Selectable color temperature from 9300, 7200, 6500K. The monitor defaults to 6500K. Box Dimensions (LxWxH) 6.1 x 4.65 x 4.45"
CLM-V55 5" HDMI On-Camera Monitor with Peaking is rated 3.9 out of 5 by 36. Rated 3 out of 5 by Anonymous from Nice but lack certain useful funtions I use it as a viewfinder when capturing video on a DSLR (D7000). The peaking function is pretty good. It only highlight the lines that are very in focus (instead of also highlighting the almost in focus area). Included hood is handle - easy to deploy; easy to collapse. Even small battery last a long time. The screen is very reflective in bright sunlight. You will only see the reflection of your face on the screen than the actual content unless you also shade your face with the hood. There is no function to help adjusting the exposure (zebra, false colour). It cannot flip the image up side down if you want to mount the monitor that way. Rated 3 out of 5 by Joel Ramos from Decent Monitor This is a great monitor from Sony for most DSLRs. The clarity of the screen, it's creative design, and the peaking feature really makes it a great asset for the DSLR filmmaker. I do not, however, recommend this product for the Canon 5D MK II, because it does not upscale the video output of the 5D when pressing the record button. Therefore, when you hit record the screen will shrink making focusing difficult. Rated 5 out of 5 by Steve Nunez from Very Good Monitor for Manual Focusing! Superb HDMI monitor solution for those looking to monitor their video recordings. It is very good for monitoring focus for those cameras that allow manual focusing. The peaking and 1 to 1 pixel checking is ideal for those shooting HD video and want to confirm focus for sharpness. The only negatives are: Sony doesn't include a battery- so one must be purchased- be aware of that upon purchasing. The other small negative is that the monitor does take about 5 seconds of pressing the power button for the unit to turn on.....it's a bit bothersome but nothing too major- would have been nice to have an instant on button or a quick single depress and get the monitor powered......other than that the unit is perfect. Small other minor point is that the HDMI port is on one side so you may need to route the cable all the way around to reach your particular camera or setup.....would have been nice of Sony added a HDMI port on either side for easy cable routing. Rated 4 out of 5 by Max Rebel from Its good for what it is. This is a great Consumer product, it does what its suppose too and well... but its in no way perfect. If you own a Canon 5D Your 480p Image will look quite small on this monitor while recording. It has no scaling option. If you own a Nikon D7000 or similar you will have 4 of LCD used for viewing the image the other 1 is filled with camera data. What was also very disappointing is that its all plastic, even the 360 swivel, It broke the second day using it. Since then I ordered a articulating arm. The Focus Assist is very precises compared to the Marshall V-LCD50-HDMI, It does have trouble showing the red lines for in focus on skin. The Menu is simple To simple and easy to access. The Colors are Perfect no calibration needed. This is a great product for someone who uses it on their own time, but never would I bring this on a paying job. One hit and its dead. Rated 5 out of 5 by Anonymous from Awesome. Must have for DSLR Film Project I am a semi-professional photographer and videographer for the Oil and Gas industry. We often shoot video on DSLR like the Canon 5D mark III. One item that I really missed on the 5D over the 60D was the ability to rotate out the LCD screen. This monitor solves that problem. It is versatile, and the image is very clear. You can rotate it as needed. We also shoot on Sony FS100/FS700 and it is very useful when attaching these cameras to Jib cranes. It gives accurate color representation of what you are capturing. It is super versatile, especially with the built-in sun shade. The only negative is that sometimes it takes a long time to synch with a camera. So don't expect it to be instant on. Rated 5 out of 5 by Michel Hernandez from Great improvement over camera display. I own a NX5U, yes from Sony as well and I was looking to improve view on outdoors and this monitors was the right answer. I just would like to at lest came with a wall charger but no battery and no charger. Expect to pay $80 more for both extra items but the monitor is a great buy. Rated 5 out of 5 by LD from Essential Can be used with any camcorder that has an HDMI output! The two hot shoe mounts work on DSLR cameras and some camcorders. By using a clamp assembly on my tripod as a mount, I adapted this field monitor. You need to order a clamp assembly with a 1/4 20 thread (several available here at B&H - listed in accessories with this review) and a HDMI cable that fits your camcorder's HDMI output. My SONY HDR-HC9 camcorder outputs via a standard HDMI type output to the standard HDMI type input on the monitor. My camcorder does Peaking in RED, YELLOW, or WHITE. On this monitor, I get any of the three signals, but the monitor displays RED only. All other features of the monitor work with my camcorder. This monitor's 5 screen is crystal clear with good resolution and displays a much better image to gauge precise focus. My camcorder's 3 LCD and viewfinder never let me reliably see the focus control I have with this field monitor. The 16:9 display mode brings in the frame edges (narrow black box around image) so I know exactly what will be recorded within the frame. All panning and tilting are displayed without any lag or delay. Once framed and in record mode, I'm now shooting almost exclusively by watching this monitor. The battery lasts a long time when fully charged. Have not gone beyond 4 hours to see how long it will last. The only limitation is outdoor, bright light makes the image on the reflective surface of the monitor a little hard to see, at times. The included fold-up monitor hood helps. In bright mid-day light I use a black out cloth over the monitor and my head for fine detail focus work. A great addition for field shooting and for review of shot footage. Will a 3:2 still image be shown in full on the screen? On the Sony CLM-V55, any image is not in 15:9 aspect, I.E. 16:9, 4:3 or 3:2, it will be letterboxed with black strips. If I use this with a Canon 6D, will the 3x3 grid be displayed? We are not able to test but it is our opinion that yes, the camera's 3x3 grid can be seen on the monitor. Press the camera's Display button until it shows on the camera. It should also be on the monitor's screen. This should be the case for any camera monitor. Does this have a DC plug or is it battery only? You can power this monitor with a DC battery or AC with this power adapter: Sony AC-PW10AM AC Adapter Kit for Select Sony Alpha SLR Digital Cameras B&amp;H # SOACPW10AM. Will this monitor work with the Black Magic Pocket Cinema Camera? It works with any camera with an HDMI out. May not fill the screen as most cameras output a low resolution version of the clip being recorded, but the screen has an 8x zoom in function that helps you keep the subject in perfect focus. I use it when placing the camera on a gimbal or a crane for perfect framing. Your Canon will work fine since it has an HDMI output. However, I want to highly recommend you upgrade to the Sony CLM-FHD5. The Sony CLM-V55 is only 800x480, whereas the screen on the CLM-FHD5 is 1920x1080 and is MUCH better. You will be pleased. Also, it takes three different models of Sony (or aftermarket) batteries vs. just one on the V55. Does the image fill the screen when used with Sony A7 camera? I want to use this on a Sony A&amp;r11 only for still photo work, will the screen rotate and fill when in portrait mode? (its the big problem with the rear viewfinder on the Sony as it can be turned up to allow viewing in portrait mode) is this monitor a good choice for still photographic work? Answered by: Glen Keith D.